Story by Milli Thornton. Photos Copyright © Lisa Carter. LE PETIT DEJEUNER on East King Street, Toronto, in the Canadian province of Ontario, is exactly the kind of funky café I love to stumble across whenever I’m the new kid in town. Not only for the food and coffee but for strategic location, close to enough city attractions to keep you busy without resorting to using the car. [Le Petit Dejeuner] has evolved from its beginnings as a first-rate all-day breakfast spot into a low-key bistro featuring a well-executed Continental card created by Belgian-born owner/chef Johan Maes. Since they do have a dinner menu and serve beer, wine, and liquor, referring to it as a café may be stretching the genre. But I was looking for the café experience (specifically breakfast and coffee) so that’s the lens through which I viewed it. We had come by road from our home in Youngstown, Ohio (about a 5-hour drive) and were in Toronto for only a few fleeting days while Brian attended a conference for work. We had a nice room at the Holiday Inn Express downtown (111 Lombard Street), which put us within easy walking distance of way more interesting stuff to see/do/eat than we had time for. But my first priority is always the adventure of scoping out the best place to get coffee the next morning. My definition of “best” is two-pronged: (1) a good espresso machine and baristas that know what they’re doing; (2) atmosphere. Taking nearby Jarvis Street on foot we had barely gone a block, to the corner of the lush St. James Park (jumping with lively black squirrels), when we hit King Street. King St. has exactly the kind of mixed culture vibe we like so we strolled westward for a while, marveling at the impressive St. James Cathedral and getting our fill of the artsy vibe in the Toronto Sculpture Garden. 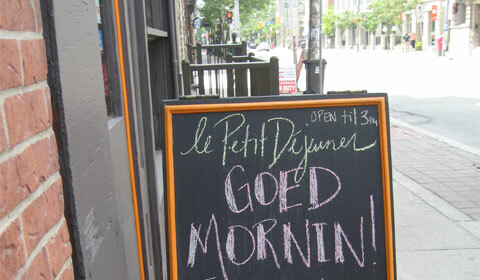 When we recrossed Jarvis Street, I spotted Le Petit Dejeuner. With my limited French I knew the name signaled “breakfast” and that was my cue. The homely orange-and-brown exterior spoke of a place that tourists might pass by but locals know how to love—we went right in and ordered a late lunch as a way to check its other potentials. It was everything I hoped for. I can’t tell you what we had for lunch: all this took place a few summers ago and my memory’s not that sharp. I would’ve blogged about Le Petit Dejeuner long before this if we hadn’t lost the photos from Brian’s Blackberry. Luckily, my friend Lisa Carter, who herself writes for this blog (Becoming Location Independent: Decisions, Decisions), was visiting family in Toronto this month on her way to Costa Rica. Lisa agreed to pop into LPD and take some photos for me. I did return to LPD the next morning while Brian attended the first session of the conference. Although I don’t remember what I ordered for breakfast, I can tell you the food and coffee was very good or I would not have wanted to write about it badly enough to wait this long for photos. Although it’s not listed on the beverage menu, no doubt I did my usual trick of asking the barista to convert a latte into my favorite drink (see The Art of the Perfect Breve). Due to the time lag this is not much in the way of a food or beverage review . . . but I can tell you about the cool hole-in-the-wall café atmosphere, and its location in the thick of Toronto’s downtown culture. 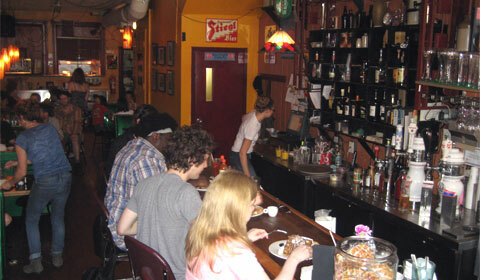 Le Petit Dejeuner is a dimly-lit, narrow room, with counter patrons on one side and booth patrons on the other. The green glitter-look benches of the booths go well with the exposed bricks and funky decor: the mural of LPD and patrons, the poster of the pink elephant (captioned Delirium Tremens, elected best beer in the world), the 1940s Rowe cigarette machine. Lesser-known Doors tracks, 60s British music and various underexposed bands play at just the right volume from unobtrusive speakers. I appreciate a place where I can relax and enjoy the background chatter and the music without winding up with an earworm (from musak) or an irritated mood (from loud cell phone users). The hissing steam from the espresso machine adds to the overall ‘music’ in the room. 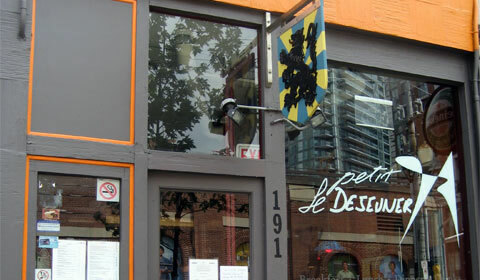 Le Petit Dejeuner is within walking distance of all kinds of stuff to see and do in downtown Toronto, such as St. Lawrence Market, the quay with ferries to various islands and the Hockey Hall of Fame. There’s the performing arts (Canadian Opera Company and Canadian Stage Company), educational opportunity (Mengrai Thai Gourmet Cooking Studio) and the kind of downtown shopping that gives you a welcome break from strip malls and department stores (Acadia Art and Rare Books, Est. 1931). Foreign countries are evident in more than just their cuisine (Chinatown, Italian Govt Tourist Board, Indonesia Consulate General) and several pretty parks invite you to refresh your spirits in nature. Le Petit Dejeuner being in the thick of all this is, in my opinion, the way it oughta be. After all, what’s a good downtown experience in a cosmopolitan city without a funky café interlude? So good to read your Le Petit Dejeuner post; I’m glad my pictures served your purpose. Going there in August was a lovely treat: though very crowded at 2 pm on a Sunday afternoon, the food was well worth standing in line for a table. 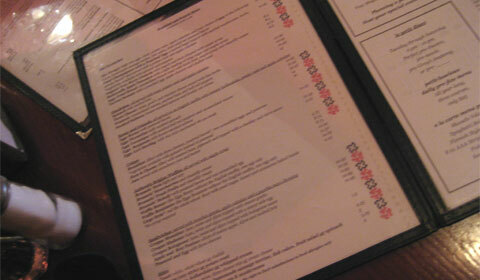 The service was excellent too, and the atmosphere unbeatable. Since we’re in Toronto often, I know this will become a fave! Oh this is great! I love cafes, diners and “greasy spoons”. Whenever we travel, we always look for a place that has local flair and flavor. Thanks! I liked your turn of phrase when you said “a place that has local flair and flavor.” Exactly! It sounds perfect! 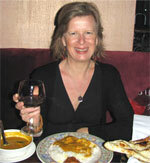 And since I’m not much of a foodie, the ambiance is the most important thing anyway! I know what you mean about the drooling. That feature photo taken by Lisa, plus the research I did for this story, makes me want to go back. To Toronto as well as Le Petit Dej.